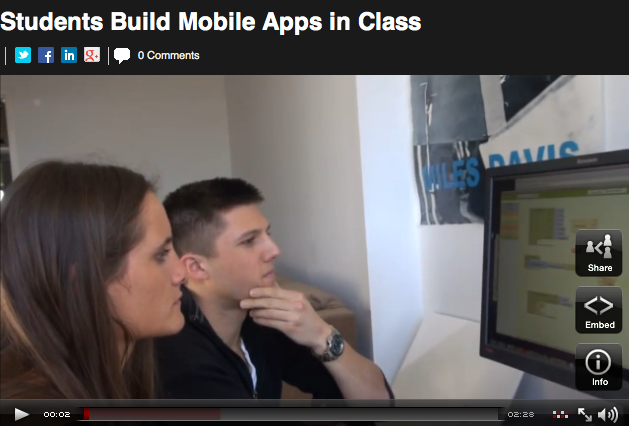 USF students Andrea Conway and Kelly Lazzara are featured in this BusinessWeek.com video report on App Inventor and our course at USF. attention? I mean BusinessWeek.com on University of San Francisco and App Inventor | App Inventor Blog is a little boring. You should glance at Yahoo’s front page and note how they write post headlines to grab people interested. You might add a related video or a pic or two to grab readers excited about everything’ve written. In my opinion, it could make your posts a little bit more interesting. Did you build this web site yourself? Please reply back as I’m trying to create my own personal website and would love to find out where you got this from or what the theme is called. Thank you! Yes! Finally something about cheapest car insurance austin tx. He fails to concentrate on his work health alliance and on his individual life. taking it all and giving none, creating havoc all around. Thanks for finally writing about >BusinessWeek. screen in Internet explorer. I’m not sure if this is a formatting issue or something to do with browser compatibility but I thought I’d post to let you know. Hi there! I simply wish to give a huge thumbs up for the nice info you��ve here on this post. this post. I might be coming back to your weblog for extra soon. with the yr to assist improve team performance. one is sharing information, that’s really fine, keep up writing. I need to to thank you for this wonderful read!! I absolutely loved every bit of it. What’s up to every body, it’s my first visit of this weblog; this blog carries awesome and really excellent information designed for readers. wonderful insight. Really enjoyed reading this blog. Keep up the good work and to everyone keep on learning! website before but after looking at many of the articles I realized it’s new to me. Nonetheless, I’m certainly delighted I stumbled upon it and I’ll be bookmarking it and checking back regularly! api communication how to k-12 open source app inventor screencasts students success stories teaching text-to-speech texting Uncategorized what is app inventor?